There is nothing more wonderful for a father than to watch his son or daughter on the field or court as they head toward victory along with their team. Whether they are playing baseball or basketball nobody can deny the thrill when their child is part of the winning team. Most fathers who are involved in their children’s lives have experienced a moment like this and it fills them with pride. But team sports are not only good for building up a proud father’s ego! 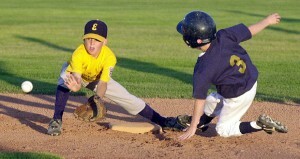 Team sports are also very beneficial to the child concerned. They help them to learn what it is like to be part of a team, to be a team player and to work with others toward a common goal. It builds their confidence and teaches them responsibility. Many children suffer from feelings of insecurity these days. Today so much is important in a child’s life and they live with lots of pressure to do well at school and to make their parents proud. They need activities that are fun and that help to ground them, making them feel more confident in their own abilities. As a father I love to go out into the yard with my child in order to throw a ball around. It gives us the opportunity to spend time together and I get to watch as my child’s abilities improve. When they are out on the field playing a match I can know that some of that skill that they are displaying has resulted from the time I have spent with them, helping them to hone their skills and to develop into a team player. This fills me with pride and I am pretty sure that other fathers would agree. Sport helps a child to grow physically, mentally and emotionally. It is not important whether you are the parent of a son or a daughter because sport is beneficial for anyone. The benefits last well into adulthood and help them when they enter the job market. Most jobs require you to work with other people but if you are not familiar with working within a team scenario it can be very difficult to adjust to that in the employment sector. Getting this experience while still young will prove invaluable by the time they graduate from school. Instead of feelings of low self-esteem and inadequacy that result in the child pulling away from their peers, sports instills confidence and the assurance that win or lose, they were part of a team. The victory is not theirs alone and nor are the losses. They learn to share both with the group and so are able to adjust when they have to work as part of a team once they leave school. Being a father is a full time investment and one that is made extra special by those moments when we see our children shine. Of course there will be occasions when their team fails to win the trophy or prize but this is all part of the learning experience. Not only will their teammates help to uplift them, they will provide the same for their teammates, learning in the process about sharing not only the victories but the defeats as well. All of this helps the child to develop into a well-rounded adult who is able to communicate and associate with others on an equal footing. Is this not part of what being a father is all about; teaching our children to be productive members of society? But sports are not only valuable to the psychological development of a child. Sports are becoming even more necessary when one considers how prevalent obesity has become among today’s youth. With all the junk food that is on offer, and most of it super-sized as well, and the fact that video games have become so overwhelmingly popular, many of our children simply do not get the exercise that they need in order to grow and be healthy. Too many children are suffering with illnesses and disorders that are directly linked to inactivity. Encouraging your child to join in sports will help to keep them active and strong, will get them out into the fresh air where they can run and expand energy as they push toward attaining the victory with their teammates. In today’s world it has become more important and necessary than ever before for parents to encourage their children to join in with some kind of sporting activity that they feel drawn to or that interests them. As we can see the benefits are too numerable to mention. Joyce Brister is a loving parent and blogger for the My Baby Blog. Joyce loves writing about situations that parents are often faced with. She would like for you to take a look at her Baby Crib Bedding Sets at her online Baby Bedding Boutique. Yeah, my kids do basketball and tae kown do. They love it and I know it really helps them physically and emotionally. Especially because we live in a dangerous city and end up not being able to just go outside and walk. So we have to stay in the apartment or go out by car. Having sports time is the moment they have to just be boys.